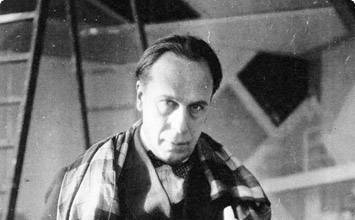 "What I am trying to realize is a universal form which entirely corresponds to my spiritual vision"
Theo Van Doesburg was one of the founders and leading theorists of De Stijl along with Piet Mondrian, which began in the Netherlands and flourished into one of the major inter-war movements. It advocated a simplified, geometric, and reductive aesthetic in the visual arts and argued that painting, design, and architecture should be fully integrated. Van Doesburg created numerous abstract paintings and designed buildings, room decorations, stained glass, furniture, and household items that exemplified De Stijl's aesthetic theories and his personal ideas. He wrote numerous essays and treatises on geometric abstraction and De Stijl, published journals, and organized many exhibitions of works by De Stijl artists and related movements. Van Doesburg's personal version of De Stijl was called Elementarism, which emphasized subtle shifts in tones, tilting squares and rectangles at angles relative to the picture plane, and allowed straight horizontal and vertical lines to be colored, varied in length, and disconnected from one another. Van Doesburg wanted to give De Stijl more variety, movement, and energy than found in Piet Mondrian's personal version of the movement, which was called Neoplasticism. This small but crucial difference in his thinking led to Van Doesburg and Mondrian's split in 1924. Van Doesburg believed that art should be an absorbing, spatial, and environmental experience. This led him to create architectural designs, stained glass, interior decoration, furniture, and other functional, daily items that were carefully related to one another and were meant to be installed together for a holistic experience. Many of these were never actually built or manufactured. Van Doesburg felt that abstraction's unique value was its ability to achieve social order and universal harmony with its precise, orderly geometry and vibrant, contrasting colors. He also felt that his reductive method had spiritually and morally uplifting qualities. His Dancers series demonstrates both his abstraction, and the spiritual inspiration he found in it. 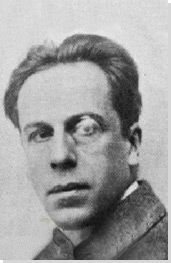 Theo van Doesburg was born in Utrecht, the Netherlands to Wilhelm Kupper and Henrietta Catherina Margadant. Originally named Christian Emile Marie Kupper, he considered his stepfather, Theodorus Doesburg, to be his natural father, eventually taking his stepfather's name when he began his painting career. Van Doesburg served in the Dutch military and during World War I (from 1914 to 1916), he was stationed near Tilburg. He was married four times; the first three marriages ended in divorce and the fourth lasted until his death. An example of van Doesburg's early abstraction work before the influence of Mondrian, Dancers presents his explorations into Theosophy and spiritualism. The two figures in the diptych are abstracted representations of the Hindu deity Krishna, dancing and playing the flute. He based the images on a Theosophy figurine of the deity, showing two sides of the figurine in the diptych. Van Doesburg sought to portray spiritual ideas which ignited his belief in the higher powers of art. The Theosophical doctrine outlined in the painting is of the harmony that exists between things on the ideal, divine level underneath the chaotic surface images of everyday existence. By abstracting away the chaotic elements, and representing the harmonious realm beyond the surface, art could make people aware of, and allow them to experience, a spiritual perspective. In the work, he borrows the techniques of Indian art, in which colors and shapes do not reflect nature, but instead express spiritual truths and states. Acting on his mission to inform people of the tenets of De Stijl, van Doesburg abstracted the image of a grazing cow, beginning by creating figurative studies, and gradually changing the image until the cow became a carefully coordinated arrangement of colorful rectangles and squares. Van Doesburg used this composition, as well as his preliminary studies, in a treatise on De Stijl that he distributed for educational purposes. This painting is part of the artist's early foray into De Stijl, and demonstrates his passion for the burgeoning movement. This painting literally demonstrates the meaning of "abstracted" or "to abstract" in that it simplifies and reduces the thing depicted, transforming it into basic geometric structural components. A contrast between Dancers and Composition VIII (The Cow) demonstrates the change in his abstraction before and after creating De Stijl. Dating from the beginning of van Doesburg's career, this work demonstrates the artist's willingness to modify his ideas about De Stijl's aesthetics. In this painting the movements of traditional Russian dancers, in quick sweeps and short stops that are carefully timed and emphatically horizontal or vertical, are suggested with long narrow lines of various colors. The colored lines seem to move in short, quick bursts and then become very static once again. Here he is combining the static order of De Stijl with dynamic rhythm, signifying the radical ideas that would cause the break between him and Mondrian. The painting, he felt, was proof that abstraction was more concrete than naturalist painting, because it realistically depicted the mental constructs behind ideas. As van Doesburg began to explore the integration of fine, decorative, and applied arts at the end of World War I, stained glass was a frequent choice for his forays into achieving this unification. The carefully arranged small rectangles and squares of clear, black, blue, yellow, and red glass with black lines created with the lead framing customary of stained glass is an early example of how he modified De Stijl to have a livelier, musically rhythmic effect not seen in Mondrian's Neoplastic painting of that time. However two decades later, in Broadway Boogie Woogie, Mondrian also experimented with incorporating the rhythmic elements of music into his paintings. So, long after van Doesburg's death, Mondrian explored some of the themes van Doesburg had pioneered. This design is an early example of van Doesburg's use of diagonal organization of rectangles and squares. It shows the octagonal shaped skylight over one of the larger rooms in the college building and the upper parts of the walls adjacent to it in a flat, diagrammatic way. He is attempting to bring elements of De Stijl into the third dimension by using the primary colors and geometry of the style in architectural designs. Additionally, he has incorporated his interpretation of the aesthetics into the diagram with the diagonals. It was this difference in opinion that is cited as the reason for his break with Mondrian. In his architectural works of this period, he hoped to prompt the viewer to a dynamic visual interpretation of volumes that did not rely on a stable construct or structure. In the following year during which he conceived of his related theory of Elementarism, and began painting his Counter-Compositions. This geometrically abstract painting is the most famous work in van Doesburg's Counter-Compositions series. It consists of rectangles outlined in black and tilted at 45-degree angles relative to the edges of the canvas. The shapes are smoothly filled in with different tones of red, blue, yellow, gray, and white. By tilting the rectangles in an abrupt but consistent way and shifting tones slightly, van Doesburg attempted to create a more dynamic and complex balance of abstract forms than that usually expected in De Stijl, which is best known from the works of Mondrian. In 1926 Hans and Sophie Tauber Arp invited van Doesburg to work with them on the design and decoration of a new entertainment complex in the L'Aubette Building in Strasbourg, and he spent two years on the project. Part of the complex was built by 1929 but it was poorly received by the public and so it was then promptly modified into a more traditional style. The color design above is for a part of the building that was never built. It is a pure and highly effective visualization of his aesthetic as applied to architecture, largely so effective because it remains a theoretical illustration with no need for practical compromises and limitations. Van Doesburg has placed his dynamic diagonals front and center, they are the focal point of the design. Created after the split with Mondrian, Simultaneous Counter-Composition is an example of the artist's newly formed theory of Elementarism. In this painting van Doesburg has retained the primary colors and geometric abstraction of De Stijl while rejecting its strict adherence to only horizontal and vertical lines with the use of diagonals, whose dynamism he felt was necessary. Four rectangles and squares of red, ultramarine blue, yellow, and black are placed asymmetrically on the canvas and cropped by its edges. Two long black lines connecting at right angles and titled at slight angles to the edges of the canvas overlap the geometric shapes. Thus it seems that two separate and "simultaneous" geometric compositions are overlapped in one painting.